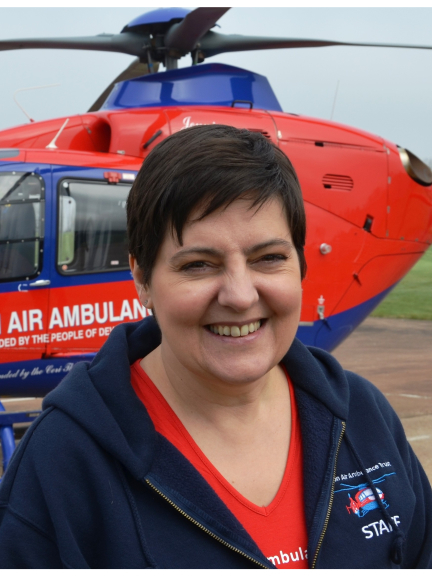 The Trustees, staff and volunteers of Devon Air Ambulance (DAA) are celebrating the news that Chief Executive Heléna Holt has been included in the Grow Exeter list of the 100 most influential women in Exeter. Heléna joined DAA in 2007 and has since overseen a wide range of developments such as the introduction of the UK’s first specialist HEMS (Helicopter Emergency Services) despatch team dedicated to tasking the aircraft, the purchase and customisation of the charity’s two emergency helicopters, the opening of a second airbase at Eaglescott in North Devon, the successful application for its own Air Operating Certificate from the European Aviation Safety Agency, establishment of a network of community landing sites and the introduction of night flying. DAA Chair of Trustees, Stephen Tyrrell, said: “Under Heléna’s stewardship, DAA has grown and developed in every aspect of its operations and service. The highlights of purchasing new aircraft, establishing new air bases and introducing night flying tend to overshadow some of the other major aspects of the impact she has had on the charity. “These include vastly improved governance and transparency, the training and development of all staff including the ground-breaking MSc in Pre-Hospital Critical Care/Retrieval and Transfer for paramedics, the development of the Senior Leadership team, increase in the number of volunteers and their training and a considerable uplift in income to pay for all of these plus future developments. “Her leadership and the direction she has steered the charity in has been based on two factors - making benefit to patients the principle driver of everything DAA does and ensuring that we really engage with the people of Devon so that they are always aware that it is their own emergency service and that we operate it on their behalf.